Reason for ranking: First, we only say this when our kids are acting like little craps and need an attitude adjustment. More importantly, this lie leads to us giving them a bunch of presents, which rules. When you’re older, people just lie to you; they never give you a bunch of awesome stuff because of it. Reason for ranking: We all know genetics are 95% responsible for how tall we end up being, but milk is good for kids. If this little white lie means they end up with stronger bones and teeth, we shouldn’t feel bad. Reason for ranking: What’s the big crime here? That we made our kid get more sleep? Puh-lease. Some day they’ll dream of getting extra sleep (and that day will be when they have their own kids). Level of wrongness: Don’t sweat it. Reason for ranking: OK, so our uncoordinated kids aren’t going to be the next prima ballerina or NFL quarterback, but so what? They tried, and getting a little parental validation is good when they’re small. As they get older, though, we’d better start speaking more frankly, or we’ll end up with a 30-year-old who lives in our basement and expects praise for doing the laundry. 17. “We’re almost there!” amidst a painfully long road trip. Level of wrongness: I won’t say anything if you won’t. Reason for ranking: What are we supposed to do? Tell our kid, “Just four and a half hours left!”? Every parent has been stuck with a whiny kid on a long car ride, and in those instances this lie could almost be described as humane. Almost. 16. The classic “I’ll check on you in a minute” as you say good night. Level of wrongness: A tiny aftershock to a tiny earthquake. Reason for ranking: Our kids are going to fall asleep in a couple minutes anyway. What harm does it do to say we’ll check on them in a minute? Level of wrongness: A tiny earthquake. Reason for ranking: Maybe their faces won’t freeze that way, but come on. They can’t keep making those ridiculous faces forever. If saying this gets them to stop, I say no harm, no foul. Level of wrongness: What’s wrong to one person isn’t to another, you know? Reason for ranking: It’s natural to want our kids to stop eating so much crap, but this is a lie you can easily get busted for telling. Kids usually know exactly how many Oreos are in the house at any given moment, so you’d better have quite the poker face. Reason for ranking: I get it. Kids ask lots and LOTS of questions, but they’re only trying to learn about the world. Encouraging their inquisitiveness is probably what we should do if we want a chance at a “World’s #1 Parent” mug. You know, instead of shooting them down because we don’t want to deal with it. Level of wrongness: Drudging up uncomfortable feelings from my childhood. Reason for ranking: We all say this — just as our parents did before us — but we all know “we’ll see” is French for “not gonna happen.” Why not just say “no”? Hmm, Mom? Why didn’t you just say no?? Level of wrongness: Cocked eyebrow. Reason for ranking: Let’s cut the bull — we all know we’re never coming back (or at least not for a long, long time). This lie may quiet a kid’s grumbling for a minute, but it also gives them false hope (which leads to more grumbling later). Kids and their grumbling, man. Level of wrongness: Pursed lips. Reason for ranking: Lying to cover up the fact we ate our kid’s leftover piece of cake isn’t one of the prettiest lies we tell, especially when we wolfed it down like an animal as we stood over the sink. Reason for ranking: It’s one thing to lie about having eaten our kid’s food, but tricking them into eating something they otherwise wouldn’t is a little messed up when you think about it. I get that sometimes we have to go to extreme measures to get our kids to eat (in fact, I may have even used this one on my daughter), but it’s no parent’s proudest moment. Level of wrongness: Long sigh. Reason for ranking: Letting our kids think we were perfect back in the day when, in reality, we were undoubtedly just as frustrating, is pretty unfair. If we don’t check this kind of revisionism, we’ll soon be telling stories about walking to school uphill in the snow both ways. Level of wrongness: Shakes head. Reason for ranking: Now this is straight up lying to a kid. Also, what are we supposed to do when our kids yell out that they see people at the park as we drive past? Tell them they’re ghosts? Level of wrongness: Come on now. Reason for ranking: This is just kind of mean-spirited. Hilariously mean-spirited, but mean-spirited. Reason for ranking: So now we’re omniscient? This lie will put knots in our kids’ stomachs, and it’s not even worth it. If they’re young enough to believe us, they’re too young to tell a lie worth a damn anyway. Reason for ranking: A dog is part of the family. 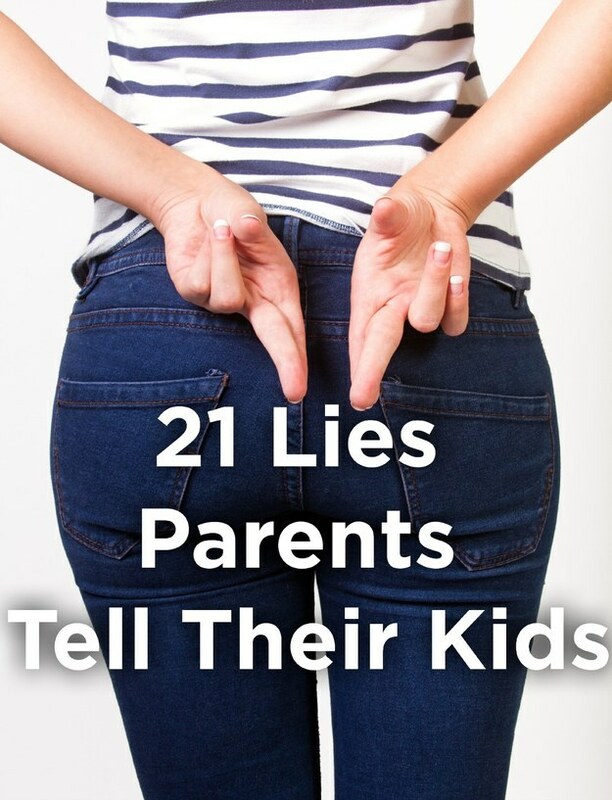 Our kids deserve to know the truth, even if it isn’t easy. We wouldn’t tell them their grandma went to live on a farm, would we? Level of wrongness: Did you really just say that? Reason for ranking: Throwing out (or hiding) our child’s toys and then making them think it was their fault it went missing has got to mess with a kid’s head — especially when they spend the next couple days searching for it. Level of wrongness: Oh, no you didn’t. Level of wrongness: Gonna need therapy.